COMPARISON BETWEEN HAYLAGE AND SILAGE, WHICH IS BEST FOR DAIRY FEEDING. In dairy farming, conservation of forages must be embraced for high production. Forages are commonly conserved in the form of hay or silage. A majority of Kenyan farmers, however, avoid venturing into either haymaking or silage making, owing to high capital expense, but many of these farmers have sufficient machinery at hand to do both operations. Conventionally, farmers are used to making hay from pasture grasses like Rhodes or legumes like Lucerne while silage is made from fodder crops like maize. However silage can still be made from both pastures and legumes alike. Some farmers may ask why one should make silage rather than hay from pasture. • Unlike haymaking, there is less bleaching of the silage by the sun with a consequent loss of carotene (vitamin A). • Bulky pastures can be ensiled easily, but not so easily made into hay. • There is no fire hazard with silage. • Silage is better as a fodder bank because hay oxidizes during storage which considerably lowers its nutritive value. • Transportation costs are higher during silage making. • Hay is more acceptable to young ruminants unlike silage. Maize is still the crop most widely used for silage in Kenya, but it could be argued that maize now, and in the future, will be grown more for grain production, both for human and non-ruminant consumption, and that only the residue (stover) will be used for ruminant animal production. • Grass silages represent a low-cost roughage feed which can be fed throughout the year including periods of drought because perennial pastures are cheaper to grow compared to annual crops like maize. In addition, the process of making grass silage is repeated three to four times every year in the same areas. Due to the rapid growth of the grass there is usually an excess of biomass in the rainy season which can be ensiled at relatively low costs, if properly made. This means that the cost of a kilogramme of grass silage dry matter is way cheaper than that of maize silage. • Higher crude protein (CP) content which favours increased milk production. Crude protein content of grass pasture ranges between 12 per cent to 17 per cent while that of maize is around nine per cent to 11 per cent. A dairy cow weighing about 500kg and producing 20 litres of milk requires a minimum of 16 per cent crude protein in its diet. The maize crop is vulnerable to diseases like maize leaf necrosis, attack by pests like army worms or ‘choking’ by weeds. On the other hand, given adequate fertilisation, grasses often thrive and smother weds while remaining relatively resistant to pests and diseases. The longer the pasture is left before cutting, the poorer the quality, although a greater bulk of material is harvested. It is preferable to sacrifice quantity for quality, but this would depend largely on what class of livestock is to receive the silage. For instance, lactating dairy cows require better quality silage compared to dry cows. Pasture species like Kikuyu grass, Rhodes grass and Star grass are harvested at a height of between 18cm to 25cm (around five weeks of growth would yield up to 3.5 tonnes of dry matter (DM) or 11.6 tonnes fresh (30 per cent DM) silage per hectare. Due to the increasing prices of hay coupled with its relative lower nutrient content, pasture silage is becoming a better alternative. However to fully realise its benefits, the silage needs to be prepared and stored well. The following are requirements for making good pasture silage. • Before closing off a pasture for silage, graze it heavily or remove any build-up of old herbage material by other means, to ensure that the new growth is of high quality. • Top dress with nitrogenous fertilizer (like CAN) after herbage removal at closing off to exploit the full potential of the pasture for optimal production. • Although some field losses will occur, most pastures should be wilted to 30 to 35 per cent DM content. Most pastures cut at the right stage for optimum quality contain about 15 per cent DM. On a hot day the rate of drying will be such that the DM increases about three to four per cent per hour. This means that one should allow a 3 to 4 hour wilting period during hot weather and about a full day’s wilting period for other times of the year. • Pasture that is chopped into short lengths (about 2.5cm) when ensiling, is easy to compact and feed out. • Plan to fill the silo as soon as possible. Otherwise, cover each day’s fill with polythene sheeting to reduce air movement. • Seal the silage within three days. Fermentation takes three to six weeks. Water or air seepage after fermentation destroys preserving acids and allows fungal development and secondary fermentation to take place. • Use additives where necessary. Legumes and some grasses like Rhodes, that are low in soluble carbohydrate (less than 10 per cent), will require a carbohydrate additive such as molasses. Passion fruit is a perennial plant that allows farmers to enjoy yields for longer periods often exceeding three years depending on management. As with most other fruits, you can intercrop passion fruit with vegetables such as leeks, onions, beetroots, spinach, strawberries and any other crop that does not share pest and diseases with the passions. 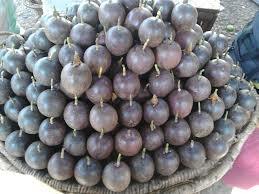 Popular cultivars include purple passion fruit and yellow passion fruit. The purple passion fruit (Passiflora edulis f. edulis) Suitable for areas with an altitude of 1100 to 2500m above sea level. The fruit has an aromatic flavor with a diameter of 4-5 cm. Yellow passion fruit is suitable for low altitudes such as coastal lowlands. It’s more hardy and vigorous as compared to the purple passion. The fruit is bigger with a diameter of 5-7 cm, relatively acidic and used for juice extraction. Of course, it’s also yellow, ha. More fundamentally, yellow passion fruit is used as a rootstalk to purple passion fruit since it’s resistant to most diseases affecting the passion fruits such as Phytophthora blight, Fusarium, wilt, brown spot, and nematodes. Yellow form – Brazilian golden, golden giant. If you have already plowed and harrowed your soil to a fine texture. We are again assuming that you have a very clear plan of your yard depending on the size of your land. Next you need to sterilize the soil since passion fruits are very sensitive to nematodes (the more you need grafted seedlings) and other disease-causing agents such as Fusarium sp. There are several ways for you to choose from when it comes to soil sterilization 1. Assumption: You have at least five to seven hours of sunshine a day. After this period elapses, remove the polythene and inoculate the area with the beneficial microorganism. The popular brand is the EM.1 found on amazon and shipped anywhere for free by Amazon.com. This is because solarisation kills all micro-organism (both harmful and beneficial ones). Your soil is now safe for growing passion fruits. 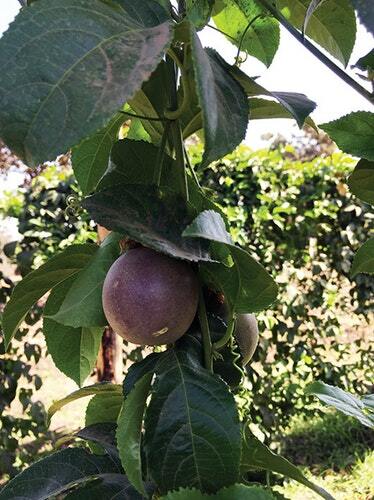 The best way to get good results is by growing your purple passion fruit from grafted seedlings. Yellow passion fruits serve as rootstalk. Plant the seedlings at a reasonable depth and recommended spacing for your area. While doing this, ensure that the graft union is not covered by the soil to avoid rotting. Remember to water the newly planted seedlings before you call it a day. Water application in the right proportions (Avoid under-watering or over-watering). Application of necessary nutrients in the form of fertilizers and foliar sprays (Always conduct periodical soil analysis to determine which nutrient elements needs supplementing). – Too much or too little nutrients might injure your plants. Frequent monitoring of the crop for pest and diseases and taking the necessary precautions (Use a holistic approach or Integrated Pest Management strategies to combat pest and diseases). It is also worth noting that in case you must spray, use only recommended pesticides and observe Minimum Residue Levels (MRLs). Support and training If you’ve done all your homework up to this point, your young plants should be growing more and more vigorously. You’ll realize this when you see dense foliage and emergence of tendrils. (Tendrils are rope-like structures used by passion vines to support themselves against other objects). Purple Passion Fruit Tendrils are an indication that your plants need support. You can support your passion fruit seedlings by erecting poles and some strong ropes or wires. Personally, I’d go for meshed wires – they do an excellent job! Once you’ve put the support structure in place, it’s time to guide the growth of those plants along the support. In a nutshell, guiding your passion seedlings to grow in the desired way is what we call training. We don’t want the fruits lying on the ground. For most beginners, this is where the dilemma starts. How do you tell when your passion fruits have matured? How do you know when to start harvesting? You don’t have to know! Unlike other fruits that need an understanding of maturity indices, passion fruits are different. Once they attain a proper physiological maturity, they detach from the mother plant and falls on the ground. Now, all you must do is get a crate and pick them one by one. This can be done twice a day depending on their volume. Just make sure you don’t leave them too long on the ground. How do you present your precious produce to your consumer? The answer to this question will differentiate you from your competition. Think deeply about your brand and communicate it through your packaging. You’ve worked so hard to feed the world don’t lose the opportunity to reap big by failing to pay attention to your presentation. Dairy goat farming is on a steady rise throughout the world. Steady rise in demand Unconfirmed projections show a steady increase in demand for goat milk; up from the current 2 per cent in terms of milk consumption. Cow milk is still and will continue to be the most consumed. As a boy I heard that goat milk talk from Okolwe my grandmother. She narrated to me that when a small breast feeding child lost the mother; goat milk was the proposed replacement. I found this indigenous knowledge to be in tandem with conventional scientific knowledge which has documented that indeed goat milk is much closer to human milk than cow milk. Okolwe’s proposition therefore was correct. Immune booster with increased incidences of heart diseases goat milk is promising to be an alternative remedy. Studies have shown that goat milk has more beneficial fatty acids. It also has low cholesterol content compared to cow milk. Subsequently people drinking goat milk have lower chances of getting heart problems. In addition, goat milk is relatively rich in potassium and phosphorous. Potassium reduces blood pressure by dilating or relaxing blood vessels further serving to reduce blood pressure. Closely tied to this property is that goat milk can help cut weight while at the same time supplying the body with requisite fatty acids. Goat milk is also friendly to the gut. If you suffer from gas and a bloated stomach after taking milk – try goat milk! Goat milk has gut anti-inflammatory components in the form of an enzyme that soothes the digestive tract. Goat milk has been shown to increase absorption of iron and copper making it a curative drink for those suffering from anaemia, lactose intolerance and stomach ulcers. With so many diseases that compromise immune systems; goat milk may be the next liquid gold. Goat milk contains a lot of selenium which is an immune booster. Stronger bones So between goat and cow milk which is the best? Studies have shown that a cup of goat milk can give you up to 40 per cent of your daily calcium and 20 per cent of daily Vitamin B requirement. Like other milk, goat milk is rich in calcium and its intake contributes to strong bones. Now as a farmer wishing to do dairy value addition; goat milk is a good bet. It makes better cheese, butter and yoghurt due to its high and quality butterfat content. Goats are also relatively cheap and easy to keep and maintain. The animals can be kept in relatively smaller space; they consume less and don’t need as much attention as dairy cows. Goats can be kept by elderly or young people with minimal injury risks during handling. They can be acquired cheaply and can multiply so fast. Goats have a higher twining capacity and can give birth to triplets. Dairy breeds that you can consider include the Galla, Toggenburg, Alpine and Saanen. HOW TO GROW RICE: EASY TO FOLLOW STEP BY STEP INSTRUCTIONS. Rice is a cash crop that feeds millions of people around the world, but you can also grow it ornamentally. Ornamentally rice can be found at speciality Garden centres and mail order nurseries. Check the tag or ask a garden centre representative to see if the variety is invasive. If it is, plant it in a lined pond only. If your pond’s not lined, mesh containers should help to keep plants in check. These containers allow fresh water in and out but will keep the roots at bay. Use soil-less media designed for ponds since it won’t colour, cloud, float away or change the PH of the water. Growing rice from seed isn’t hard as you may think. Soak the seeds in water for about 36 hours and allow to dry for 24 hours. Fill a bucket with 6 inches of a mixture soil and compost. Add about 5 inches of water to cover the soil. Evenly spread the seeds in the bucket and place in a warm, sunny area. Periodically add more water to maintain a constant 5-inch depth as the plants grow. Depending on the type of rice and your climate, it can take up to 160 days before you can harvest any grain. But don’t expect a harvest big enough for a good meal. If you want rice by the pound, that’s better left to the professionals.